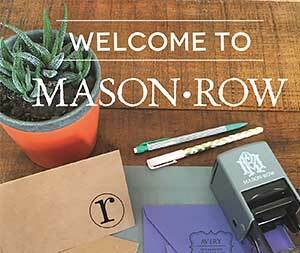 Inspired by today's cutting-edge stationery design, the Mason Row set out to create a source for custom products with design flair not found anywhere else. In an era of technology overload, we believe that social correspondence is more important than ever--what better way to make the best possible impression than with a personalized stamp or embosser. At Mason Row, our hope is that you will find original and creative ways to celebrate and recognize weddings, births, birthdays, anniversaries and so much more. Our personalized products give you the creative palette to work from and inspire great gift ideas. After all, everyone loves a personalized gift! Our guarantee is the finest quality products and the fastest delivery time available, anywhere. Quite simply, we hope to be your exclusive source for the best in custom engraved products.